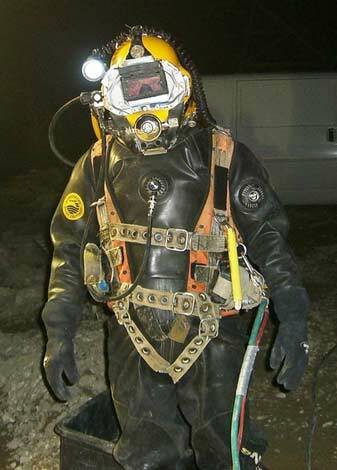 Since 1989 our diving company conducts all kinds of work underwater. We provide our service europe-wide. We implement our work in all kinds of waters, inshore as well as offshore. As industrial divers we are specialized on all different kinds of work underwater: welding and firing, concrete for underwater use, suction and purging work, repairing and exchanging stirring devices etc. in clarification plants, digestion towers and all different waters are among our everyday tasks. All our divers stand out due to long term experience. The present prescriptions of the DGUV V40 and occupation cooperative for construction are fulfilled. in contact with you and give you more information about our work. 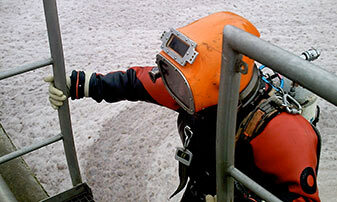 The circumstances underwater are very complicated but common for an industrial diver. Working in black water is an everyday job. 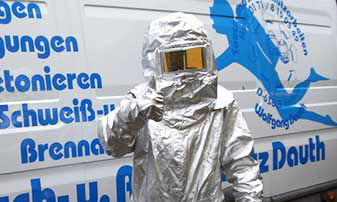 A diver often can't see anything underwater, thats why absolute professional equipment is essential. Checking the equipment and working together as a team (a diving team always consists of at least two skilled divers and one person for the code flag halyard) is a necessity. 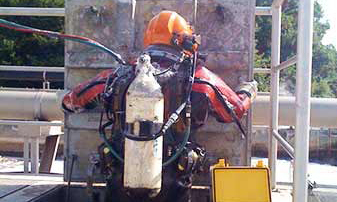 Our industrial divers often work in clarification plants, pipes, digestion towers and sewage systems which means complicated circumstances with extreme little space and difficult visibility conditions. Welding, handling a welding torch, working with underwater concrete or installation work without a view demand great mechanical skills- and absolute security during every single movement underwater. But still we are always likely to accept these challenges. Diving is our profession.